To make the Mushroom Filling: Place the dried mushrooms in a medium bowl and cover with hot water. Allow to soak for 15-30 minutes, or until the dried mushrooms become tender. Drain the dried mushrooms, reserving the liquid, slice the rehydrated mushrooms and set aside. Combine 1 cup of the reserved mushroom soaking liquid with the vegetable stock cube and cornstarch. Stir until the stock cube and cornstarch have dissolved. Set aside. Heat the olive oil in a frying pan over a medium heat. Add the sliced baby onions and fry for 3-4 minutes, or until onions are beginning to become soft. Add the garlic and cook for a minute more. Add the button mushrooms and continue to cook over a medium heat for 2-4 minutes, or until they start to soften. Add the Swiss mushrooms and cook for 2 minutes further. Place the sliced rehydrated mushrooms into the pan and turn the heat up to high. Pour in the wine and allow to simmer for 1 minute, then add the mushroom liquid stock cube mixture. Turn down the heat to low and let the mushrooms cook over a very gentle heat for 10-15 minutes, or until the Mushroom Filling has reduced a bit. Remove the Mushroom Filing from the stove and stir in the soy creamer. Taste for seasoning and add salt and pepper to taste. To make the crust: Pre-heat the oven to 350 degrees. In a large bowl, rub the margarine together with the flour until it resembles fine bread crumbs. Add the dried thyme and a pinch of salt. Stir to combine. Add the cold water, one drop at a time, until the mixture forms a dough. You may not need all the water. Roll the dough into a smooth ball, cover with plastic wrap and refrigerate for 10 minutes. Prepare a 35 centimeter pie dish with a light coating of vegetable shortening and set aside. Remove the dough from the fridge and cut into 2 pieces, 1 slightly larger than the other. Prepare a large, flat surface with flour. Roll the larger dough ball out on a floured surface large enough to line the base and sides of your pie dish. Lay the pastry into the prepared dish, prick with a fork a couple of times and return the dish to the fridge for another 10 minutes. Roll out the remainder of the pastry to form the pie lid. To complete the Mushroom Pie: Pour the mushroom filling into the prepared pie crust. Trim the edges of the pastry from the dish and top with the pie lid. Seal the edges of the pastry case by gently pressing down with a fork or your fingers. Cut a cross in the middle of the pie lid, sprinkle with black sesame seeds and lightly brush with milk. Bake for 20-25 minutes, or until the crust is golden and mushroom filling is bubbling. 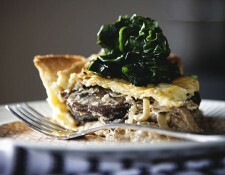 Remove from the oven and allow the Mushroom Pie to sit a few minutes to cool slightly. Cut in equal pieces and serve topped with blanched spinach. This entry was posted in british, entree by admin. Bookmark the permalink.